Many of the nineteenth-century recipes from The Cookbook of Unknown Ladies were transcribed from Dr William Kitchiner’s best-selling cookery manual, The Cook’s Oracle. 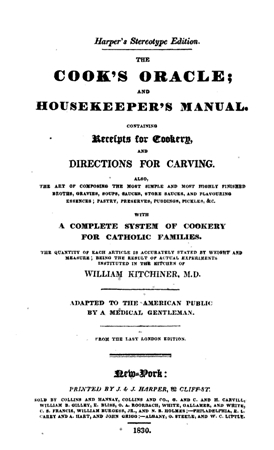 First published in 1817, this comprehensive guide for the domestic cook took the UK and US by storm, and made Kitchiner a household name. 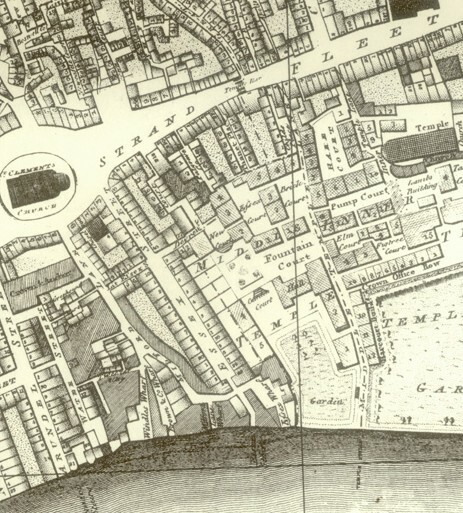 William Kitchiner was baptised at the Church of St Clement Danes, Westminster, in 1778. His family had strong ties to the local area: his father operated a very successful coal merchant business from the Strand and owned several properties in the vicinity. Following the death of his father, Kitchiner inherited a considerable fortune: about £60,00o. These comfortable financial circumstances allowed him to dedicate his life to subjects that really interested him, rather pursuing a career in a more conventional profession. Kitchiner was a man of eclectic interests, with music, telescopes and fine food among his principal passions. He wrote extensively on each of these subjects, and his research in the field of optical science saw him elected a member of the Royal Society. But it was his skill in cookery – and most particularly, cookery writing, for which he became best known. In 1817, Apicius Redivivus, or The Cook’s Oracle appeared. It was written in an easy-to-read style and covered all aspects of managing the domestic kitchen: from the planning and preparation of dishes to how to clean up. Kitchiner even included shopping tips: Butler’s herb and seed shop at Covent Garden features several time, and Lambert’s Oil shop at Ludgate Hill also gets a mention. Kitchiner shopped at Butler’s, a herb and seed shop in Covent Garden. 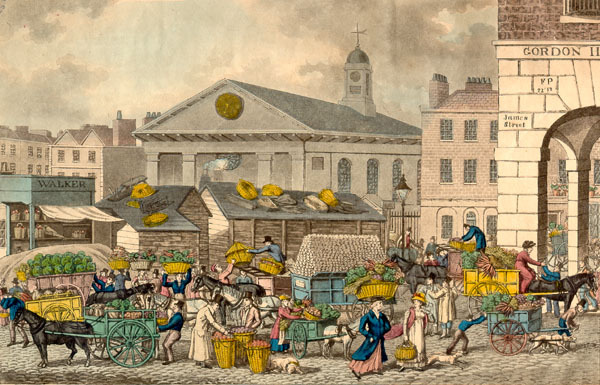 This print shows the market in the 1820s. Most of the recipes in the book had been tried and tested by Kitchiner. Some had even been invented by him! Wow-wow sauce was among his most popular creations. People lapped up Kitchiner’s practical home economics, and by the 1820s he was something of a celebrity. He ran weekly meetings of a ‘Committee of Taste’ at his home, 43 Warren Street, Camden. Invitations to these gastronomic dinner parties were highly prized, but Kitchiner could be a rather gruff host. His guests were instructed to “arrive at seven, go at eleven”. Those who arrived late would find themselves locked out, and those who wished to linger after the party were firmly ushered into the street! Kitchiner died unexpectedly at the age of 51. He suffered a heart attack on the way home from dining with his friend John Braham, and died the next day, on 27 February 1827. He was buried at St Clement Danes. Kitchiner’s fame was not so short-lived. The Cook’s Oracle ran to several posthumous editions, and his recipes inspired generations of cooks after him. Today, there’s little official recognition of the man. His home at Warren Street has long since been demolished, and the site is now occupied by a large office block. There’s no surviving trace of Kitchiner there, no plaque or monument to this giant of the Regency culinary world.